Organization-wide permissions allow enterprise admins to enforce settings across all teams under the Enterprise. An Enterprise Admin can set permissions from the Enterprise User Management Dashboard under the Team Settings tab. Team visibility allows control over the visibility settings for all teams under the Enterprise. 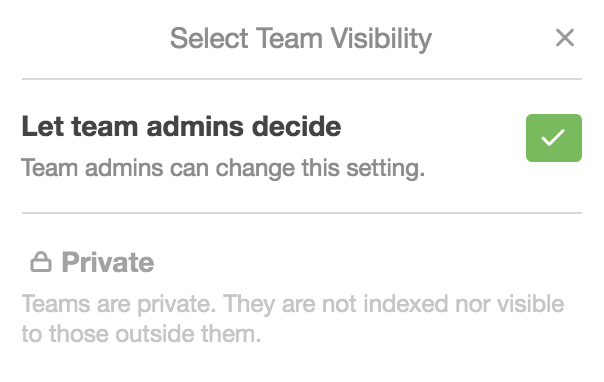 By default, team admins will be able to control the team's visibility at the team level. If set to Private, all teams under the Enterprise will have their visibility settings overwritten, and will not be indexed or publicly visible to non-team-members. 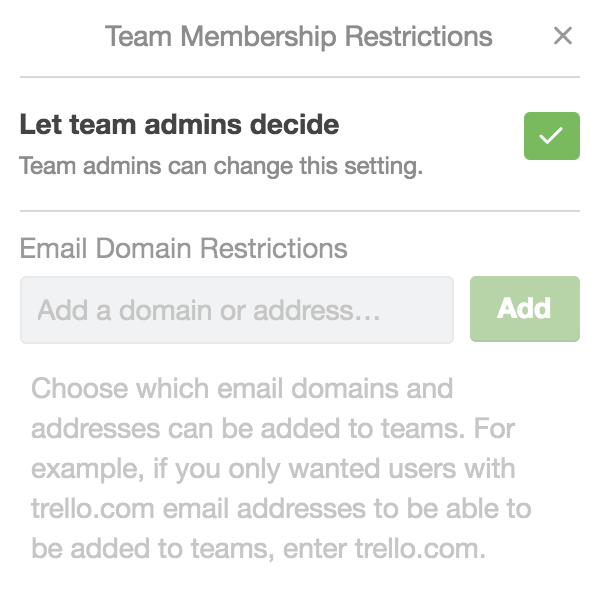 This setting allows Enterprise Admins to restrict email domains for team-members across all teams on the Enterprise. This will prevent team admins from adding users whose accounts are not registered to an email address under one of the whitelisted domains. Board creation restrictions allows Enterprise Admins to limit the types of boards that can be created across their Enterprise Teams. By default, team admins will have control over this setting for each individual team. Board creation can be restricted to any team member, team admins only, or nobody. 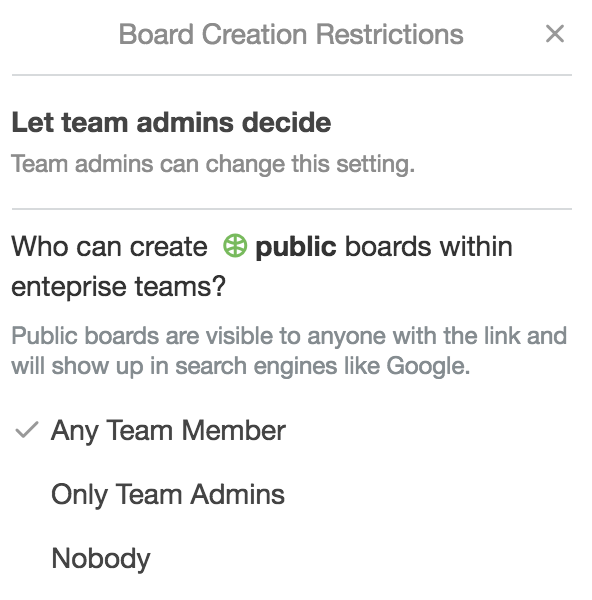 If Nobody is selected, even team admins will be unable to create that type of board on the team. 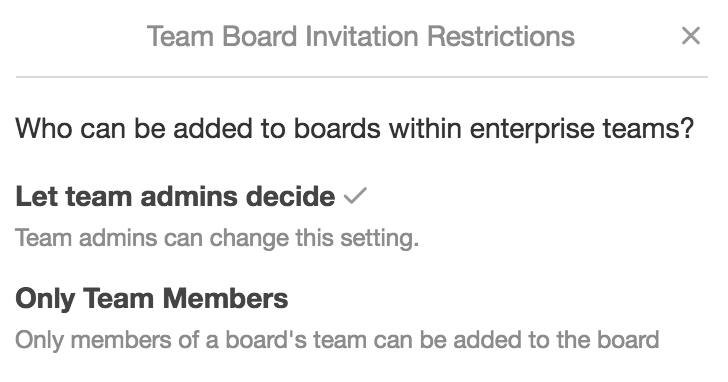 Invitation restrictions allows admins to prevent non-team-members from being added to boards across all teams in the Enterprise. Once set, this prevents collaborators from being added to any boards on any Enterprise teams. Enterprise admins are able to restrict attachment sources across all teams on the Enterprise. By default, all attachment sources available to all users are allowed. 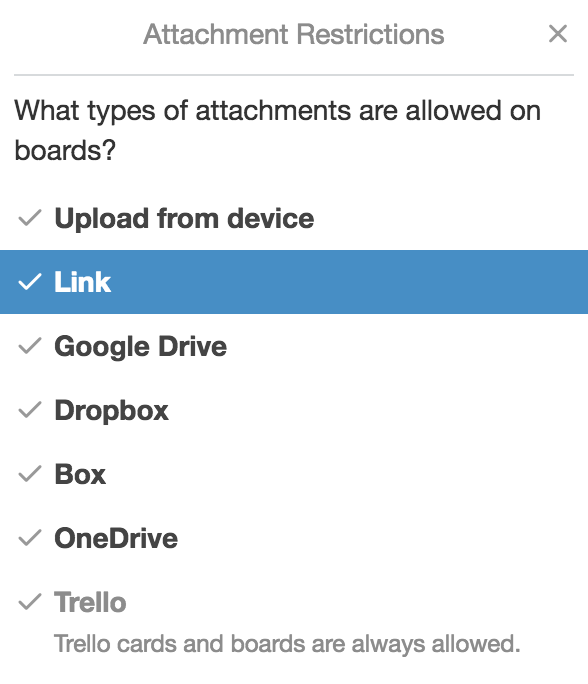 Attachment sources can be enabled or disabled individually, allowing the admin to customize which sources are allowed. Links to other Trello cards or boards are always allowed, and cannot be restricted. Here, only files uploaded from team-members local computers, along with Trello links, will be allowed on all team-boards under the Enterprise.